Virginia Diaz Pagenkiopf (Vicky) is a certified Family Nurse Practitioner (FNP). She graduated from UCLA in 2009. A nurse Practitioner is a registered nurse who has advance education and training. Nurse Practitioners can provide similar care as a Physician. Nurse Practitioners can prescribe and conduct diagnoses. In the state of California Nurse Practitioners work closely with Physicians. Vicky has lived in Santa Barbara County for over 30 years and she feels blessed to be able to work in this community since first entering the medical field. Vicky previously worked at Santa Barbara Cottage Hospital for 10 years as a Registered Nurse (RN). She worked in different departments including medical surgical floors, outpatient surgery, as well as a dialysis nurse. She obtained her RN from Santa Barbara City College and her Bachelor’s degree from Cal State Fullerton. She attended UCLA from 2007-2009 and graduated with honors. After graduating from UCLA in 2009, Vicky continued to work in Santa Barbara & Ventura County. Her experience as a nurse practitioner includes working in the emergency room (St John’s hospital), primary care (Buellton Medical Clinic), home care visit (DASH), as well as providing care for patients in skilled nursing facilities (Sansum clinic). Besides working at Dr. Hrach’s, Vicky is currently working at Sansum clinic in the endocrinology department. Vicky first met Dr. Hrach as a patient several year ago. Later on, Dr. Hrach provided Vicky with mentorship and guidance when she was at UCLA. Vicky spent several months at Dr. Hrach’s doing a clinical rotation. Vicky loves patient care. 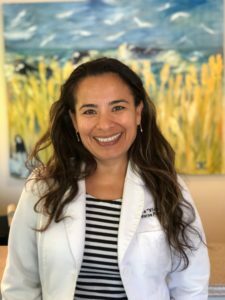 Her goal is to provide patients with the best care possible by treating the patient as a whole. .
Vicky is a member of the California Association of Nurse Practitioners. She was previously president of the CANP channel Island chapter. She is the founder and currently the event director and membership chair of CANP Santa Barbara chapter. Vicky is an active volunteer at the Senior Expo, and flu clinics. Vicky married the love of her life, Dano Pagenkopf in 2014. They have a dog named Guillermo and a cat named Boogie.